By Lindsay Menard-Freeman, Women Deliver. This blog post first appeared on the Women Deliver website. There is a clear link between a girl’s access quality education and her ability to live a healthier, more productive life. We also know that one of the major reasons why girls drop out of school is that they lack of access to sanitary facilities and supplies. Without access to basic menstrual supplies and sanitation, girls’ health and educational opportunities are marginalized. The long-term consequences of this preventable reality for girls create a ripple effect among their communities and, collectively, the global economy. 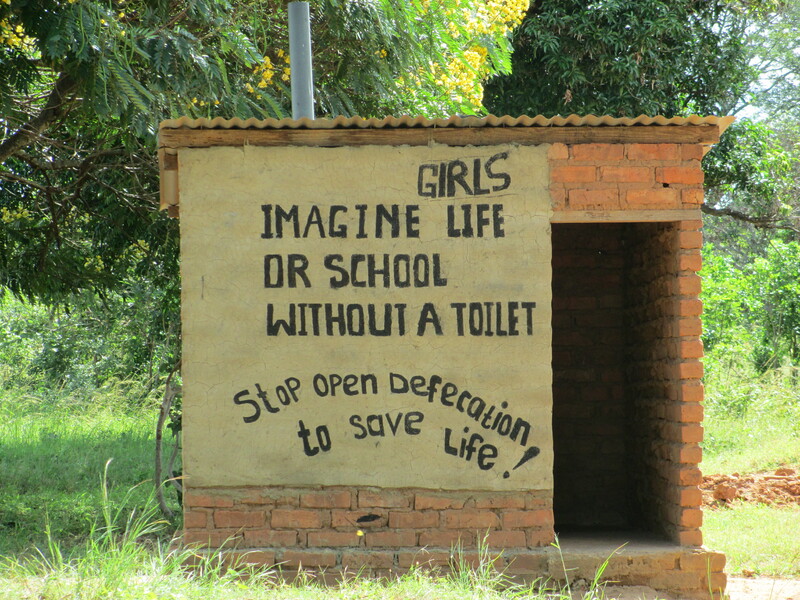 Clean water, adequate sanitation and proper hygiene require appropriate facilities and an awareness of good practices, and FHI360 and CARE are making this happen in Zambia through their Schools Promoting Learning Achievement through Sanitation and Hygiene (SPLASH) partnership. CARE International supports the construction of boreholes and sanitation facilities, while FHI 360 supports teacher training and curriculum development. Local ministries, nongovernmental organizations and communities take it from there. SPLASH is a five-year project started in 2011 funded by USAID Zambia to reach more than 240,300 primary school pupils in three districts of the Eastern Province (Chipata, Lundazi, Mambwe and Chadiza). SPLASH aims to improve pupils’ health, learning and performance by increasing their access to safe water and adequate sanitation and improving their hygiene and health practices at school and at home. SPLASH is implemented by the global environmental health projectWASHplus, which is led by FHI 360 in partnership with CARE and funded by the U.S. Agency for International Development. To date 62 committees have been formed, whose members include pupils, parents, and teachers tasked with ensuring that WASH in Schools in achieved and sustained. 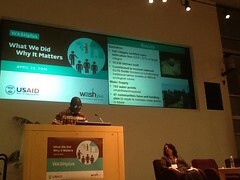 WASHplus has rolled out training for 37 of the committees thus far. 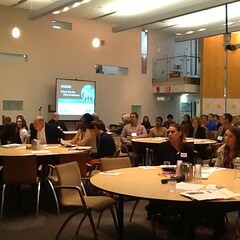 Participants learn of the committee’s roles and responsibilities, the importance of WASH in Schools, and how to operate and maintain school WASH facilities. The committees are encouraged to put in place small doable actions to improve hygiene and sanitation in their schools and neighboring communities. The solution in Yosefe School was simple: create a washroom for girls of all ages, so that girls who were menstruating are not stigmatized, and stock the toilet with proper supplies like soap, sanitary pads, and other necessary toiletries. Clean, safe sanitation facilitates help to keep girls in school, and community-based solutions help make that happen through programs like SPLASH. To learn more about FHI360’s Let Kids Learn project, click here. An official visit to water, sanitation and hygiene projects highlighted how USAID funds are transforming the lives of poor communities in Bhola, Bangladesh. This blog post is authored by WaterAid and first published here. WaterAid was honored to receive a visit from His Excellency Dan Mozena, US Ambassador to Bangladesh, and Ms. Janina Jarulzelski, USAID Bangladesh Mission Director. 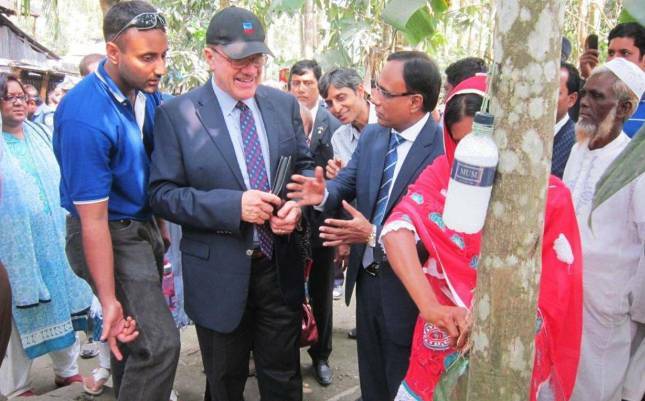 The delegation came to see some of WaterAid’s water, sanitation and hygiene (WASH) projects in Bhola, Bangladesh that form part of the WASHplus program supported by USAID through FHI 360. Bangladesh is one of the world’s most densely populated countries. Despite progress in recent years, infant mortality rates remain high, with preventable water-related diseases such as diarrhea claiming the lives of more than 7,000 young children every year. In addition to being contaminated with human waste, many water sources are unsafe to drink due to the presence of naturally-occurring arsenic. HE Mozena and Ms. Jarulzelski spent time with members of the Community Development Forum (CDF), an organization set up to put local people at the heart of improving access to safe water, sanitation and hygiene within their communities.The CDF members explained how the health benefits of sanitation projects rely on 100% participation amongst villagers. To stop the spread of disease, everyone has to agree to safely use latrines, so the community has to pull together to motivate each and every household to build a latrine and commit to becoming an Open Defecation Free (ODF) village.As in many other poor communities across Bangladesh, affordability of sanitation facilities is a real concern in Bhola. The delegation heard how the community was presented with a range of environmentally friendly sanitation options, which included very simple structures that could be constructed using low-cost, locally available materials.Local schools are actively involved in the projects. During the visit, students were happy to show off pristine new sanitation blocks and demonstrate how simple, cost-effective measures such as ‘tippy taps’ made from old water bottles can help encourage everyone to wash their hands after visiting the bathroom.CDF members also demonstrated the use of portable arsenic testing kits used to assess whether local drinking water sources are safe to drink. This blog post first appeared on K4Health Highlights on March 13, 2014, and is authored by Angela Nash-Mercado, formerly JHU-CCP Partnerships Director. 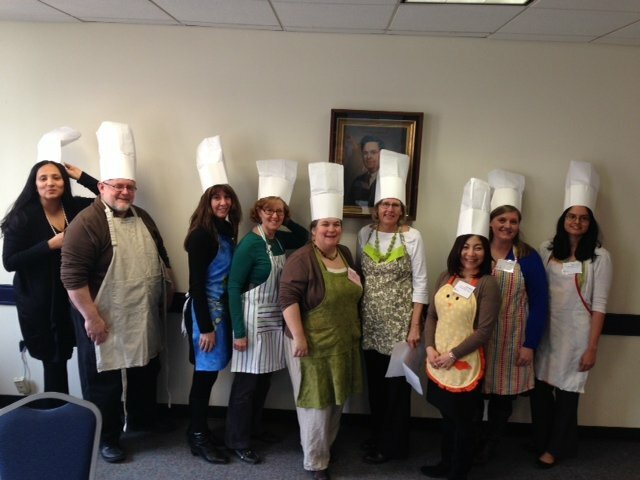 K4Health and the WASHplus Project hosted “Cooking Up Knowledge Management: Recipes for Practitioners” at the 2014 Global Health Mini-University. Data visualization is an art. Structure and storytelling should come first. Know your audience and their background. Pre-test your data visualization with your target audience to ensure it is communicating the right message. Learning should be flexible and adaptable. Be aware of generational divides with technology. Use feedback loops to meet user needs – for example with surveys. Define clearly “knowledge” that you intend to measure. Identify “knowledge outputs” before designing specific measurements. Selection of indicators is often driven by donor and program priorities. Put knowledge where people will see it when they need it. Use appropriate language and avoid jargon. Know your audience and level of expertise. Get to the point to avoid the “too long/didn’t read” effect! Redefine role of knowledge manager/social media strategist. Build a business case for social media to drum up organizational support. Develop your social media workflow. It’s not about reaching so many people, it’s about reaching the right people. Not everyone has an always-on, always-connected lifestyle; so keep up the “dark sharing” i.e. emailing. Managing across boundaries requires dedicated staff and commitment from leadership. 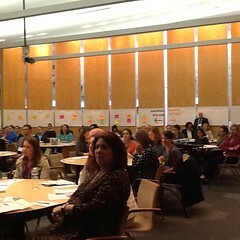 Were KM sits in your organization makes a difference. Sometimes simple tools and methods work the best. Demonstrate effective knowledge management methods to build a culture of sharing and (good examples makes it seem easier). Look for champions at different levels to help facilitate the flow of knowledge and information. For me, I always enjoy the opportunity to have conversations about the issues individuals and organizations face in knowledge management. This session was a reminder that there’s not a one-size-fits-all approach to KM but there are some common lessons we can all learn from. WASHplus and Peace Corps/Benin have teamed up to Produce a set of training and job aids for Peace Corps Volunteers and Their Counterparts. Eventually, Peace Corps / Benin Would like all Volunteers serving in Benin to Have Some WASH WASH training to integrate into whatever Their primary focus is programs – education, health, environment. Part 1 – Boîte à Outils: Assainissement Total Pilote par la Communaute (ATPC), 2014.Cette boîte à outils soutient l’exécution de la méthode « Assainissement Total Piloté par le Communauté » (ATPC). Cette méthode est basée sur les activités qui permettent aux membres de la communauté de prendre conscience du fait que la défécation à l’air- libre est un risque sanitaire pour tout le monde. Part 2 – Le Manuel Pas a Pas, 2014. Part 1 – Boîte à Outils: Le Traitement de l’Eau et la Conservation Sûre, 2014. Avoir accès à l’eau potable est un élément important pour rester en bonne santé et éviter les maladies – spécifiquement les maladies diarrhéiques. Part 2 – Manuel de Formation des Comites de Gestion d’Eau Villageois, 2014. Les matières dans cette boîte à outils servent principalement à aider les personnes chargées de promouvoir le traitement de l’eau et la conservation au niveau des ménages. Part 1 – Boîte à Outils: l’Eau, l’Hygiene et l’Assainissement (WASH) en Milieu Scolaire, 2014. Pour cela, nous avons développé cette boîte à outils pour les activités en vue de la promotion de l’eau, l’hygiène, et l’assainissement (dénommé WASH) en milieu scolaire. Cette boîte contient l’essentiel pour la réussite d’une gamme d’activités. Part 2 – Guide des Possibilites d’Assainissement en Milieu Scolaire: Options pour l’Amelioration de ‘Assainissement, 2014.